THEIR GREATEST WEAPON IS FEAR. YOURS IS AN ASSAULT RIFLE. Now overrun with swarms of monstrous genetic creations led by their nefarious alien overseers, the underground facility of Subterra Bravo is the epicentre of an unfathomable government conspiracy - one that must be kept secret at all costs. To cover up the truth, the shadowy agency in charge of the operation has initiated Omega Protocol, dispatching an elite team of commandos to retake Subterra Bravo and eradicate all evidence of the sinister creatures within. But the threat these creatures and their alien overlords pose may be far greater than anyone can imagine. 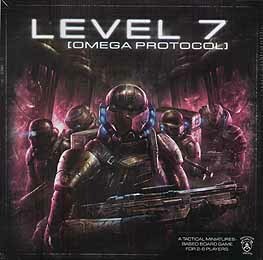 Level 7: [Omega Protocol] is a tactical miniatures based board game for 2-6 players. Fearlessly enter the belly of the beast as part of a highly trained team of operatives and work together to neutralize all threats, or take control of the creatures inhabiting Subterra Bravo and ensure the human intruders know true terror before they meet their grisly fate. 156 Tokens and 74 Markers.